Casting A 'Safety Net' For The Homeless Dr. Jim Withers founded Operation Safety Net after he began making "house calls" under bridges in Pittsburgh, Pa. Now it's one of the nation's first full-time street medicine programs. In 1992, Dr. Jim Withers began making "house calls" under bridges in Pittsburgh, Pa. — sometimes dressing as a homeless person to help earn the trust of the truly homeless. 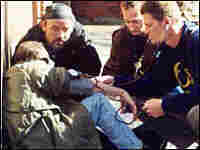 Other volunteers joined him, and out of their efforts grew Operation Safety Net, one of the nation's first full-time street medicine programs. It provides medical attention and case management to the homeless, and helps train medical professionals to work more effectively with poor and homeless patients. The nonprofit organization operates under the aegis of the Pittsburgh Mercy Health System, where Withers is a faculty member in the Department of Medicine.